A beloved community playground underwent an extreme park makeover recently. 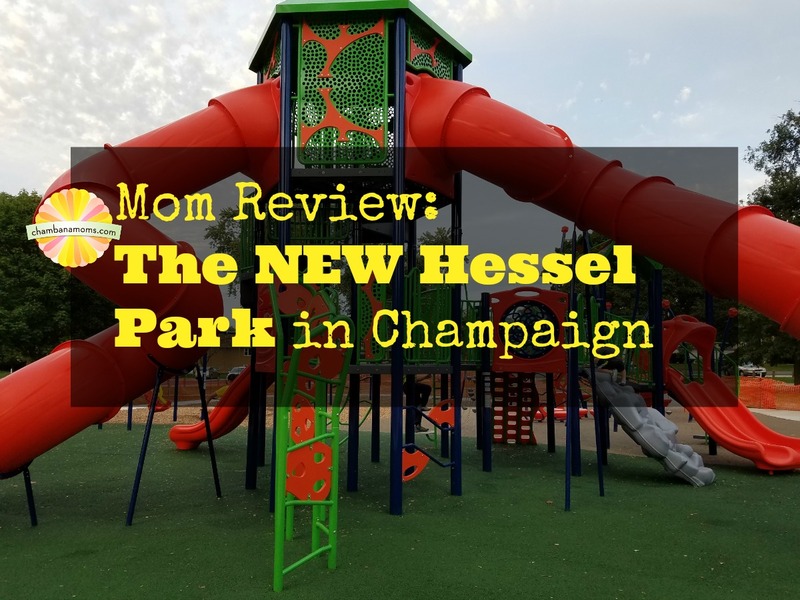 The Champaign Park District (CPD) did a fantastic job completing phase 1 of its Hessel Park overhaul. 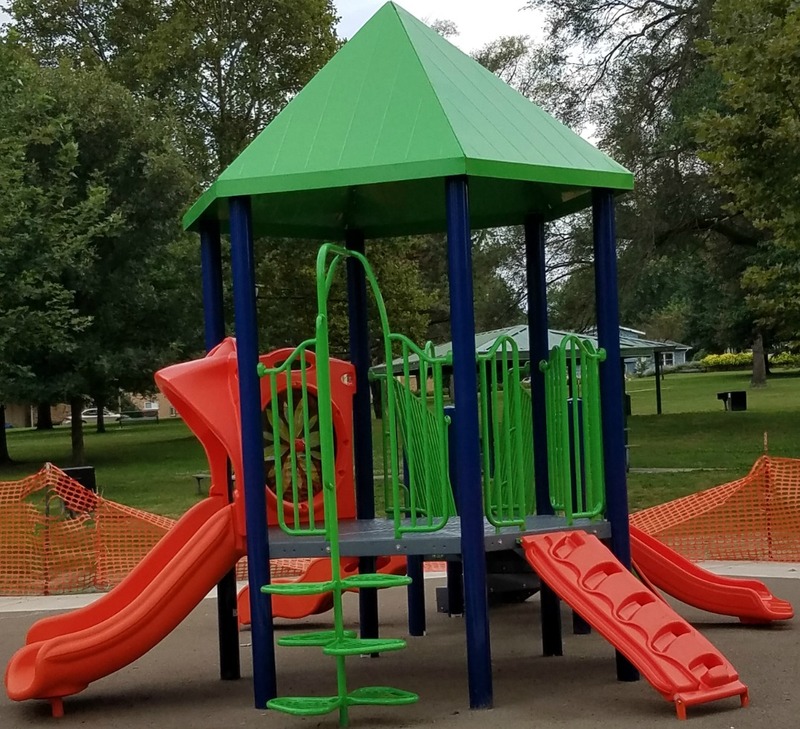 The completed phase was on schedule, and it was finished just in time for kids to experience the new playground with plenty of good weather left. The new playground resides just south of the old playground and splash pad at 1401 Grandview Drive in Champaign. 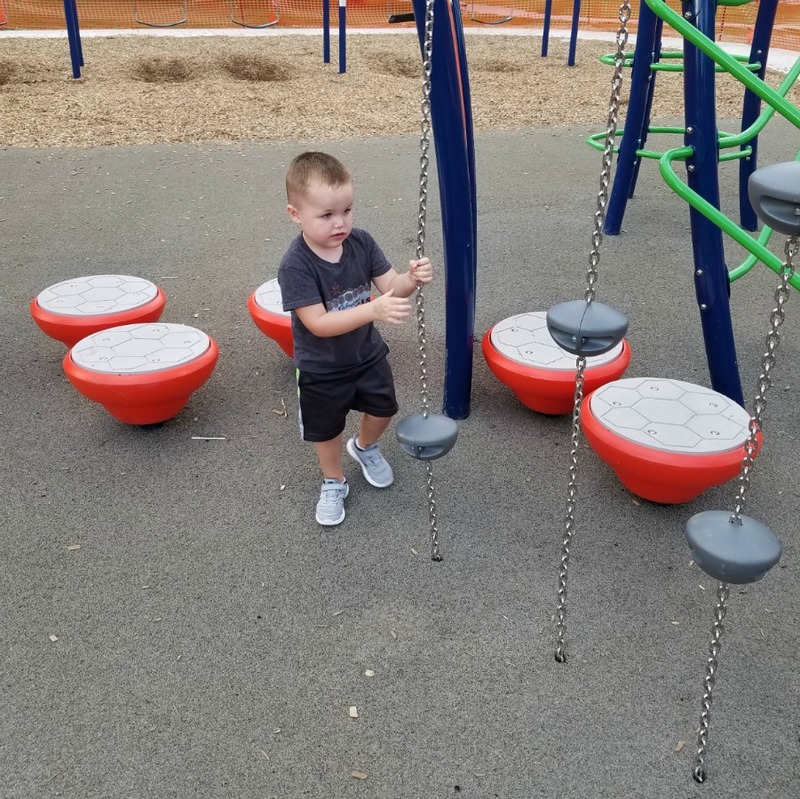 My son and I excitedly went to visit the new bright and shiny playground, for we had anxiously watched it “grow” all summer long. We live in Savoy, but I grew up close to Hessel Park. It holds a soft spot in my heart. My parents still live close, and they bring their grandboys often. The first thing I noticed was how similar it was to our newer Colbert Park in Savoy. Very similar in size, color and features — which is a great thing, for Colbert has become a destination park in our community. Hessel, however, chose to use mostly a mulch-free base for its equipment. We came after a rainy day, and it was mess free. Most notably, the innovative swings and sun catchers are the same at both parks. These are my two favorite features. On a sunny day the sun catchers filter colors on the ground — think stained glass. The sun catchers provide a good opportunity to teach colors! Kids love to hop from one color block to the other. The two parent-child swings were obvious hot spots at the new park. This swing is basically the amalgamation of a regular belt swing and a toddler bucket swing. You get to face and interact with each other instead of staring at their back while you push them. The parent “pumps” his legs to increase momentum, and the kids giggle in delight. There are two HUGE twisty tube slides that connect to a multi-level tower. My son didn’t want to go down them, but he did want to stand at the top of the tower and talk other kids into going down. One little girl went down, and she got turned around and bumped and thumped her way to the bottom. With that said, I recommend these slides for kids a little older — maybe school age. There are plenty of other attractions, though. This larger piece of equipment has a rock wall, dueling slides, a perfect toddler slide, multiple climbing features and much more. Adjacent to the main attraction is a web to hang from, another smaller twisty slide and chains that hold platforms to balance from. There is a separate structure for the younger set, maybe young walkers, that has a doohickey for spinning and a small slide. Standing alone are a bank of traditional belt swings, bucket swings, a wheel-propelled merry-go-round and a teeter totter for four. Watch out for the closing latch on the modified swing. It can come down fast. CPD director of marketing and communications Chelsea Norton said the comments regarding the new playground have been fantastic. She further mentioned the only remaining pieces to phase 1 are removing the orange fencing once the grass seed takes. When you visit, you’ll see a few stragglers still playing at the old park. Best to reminisce now, as this portion of the park is set for a makeover, too. Originally the new splash pad was set for completion in spring 2017. This splash pad will go where the old park is now. Norton said the final steps have been delayed due to financial issues. “The bids were about $150,000 over our budgeted amounts,” Norton said. After regrouping, the CPD states the new splash pad and restrooms are now set to be completed in fall 2017. The CPD will also address the location of the new pathways, so they meet the American Disabilities Act standards and make the facility more accessible from the circle drive. The CPD is investing about $1.2 million into Hessel Park with these improvements. Visit the new park now, and you can envision what 2017 will hold for the new splash pad area!